Taliban fighters gather with residents to celebrate a three-day cease fire marking the Islamic holiday of Eid al-Fitr, in Nangarhar province, east of Kabul, Afghanistan, June 16, 2018 (AP photo by Ramat Gul). A little more than a year after the launch of its new South Asia strategy, the Trump administration—without officially announcing a change in approach—appears to have refocused much of its efforts in Afghanistan around a long-elusive peace process. Gen. John Nicholson, the departing top military commander of U.S. and NATO forces in Afghanistan, backed up the Afghan government’s extended cease-fire with the Taliban during the Eid al-Fitr holiday in June, and Secretary of State Mike Pompeo recently appointed former Ambassador Zalmay Khalilzad as a new special envoy tasked with leading reconciliation efforts. 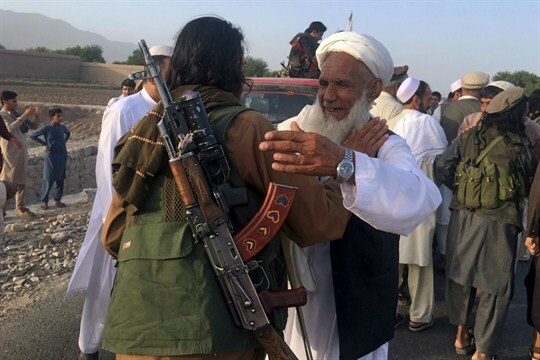 But despite that summer cease-fire and some preliminary opening discussions with the Taliban, violence has persisted and full engagement on negotiations by all the warring parties is still elusive.